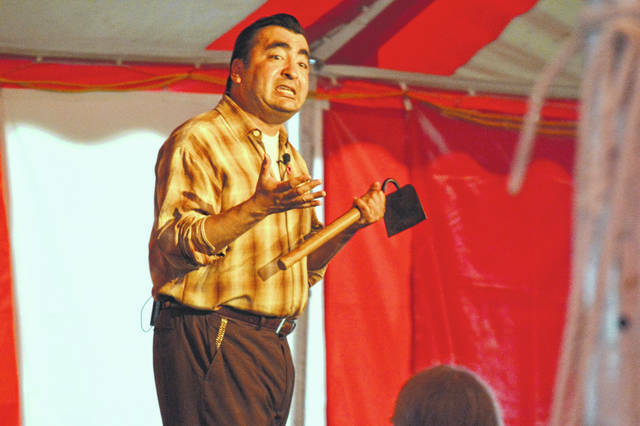 Fred Blanco, as Cezar Chavez, performs Wednesday evening in Gallipolis City Park. Here he holds a shortened hoe which was used by workers in farming because field owners felt it enhanced work performance. Among eliminating the short hoe, Chavez and his supporters fought for clean water and better working conditions as union members. GALLIPOLIS — With Fred Blanco as Cesar Chavez having performed Wednesday night, Sally Ann Drucker voices her performance as women’s activist and author Betty Friedan in the red tent in City Park as part of Ohio Chautauqua at 7:30 p.m. and with music starting at 6:30 p.m., this evening. The event is free an open to the public, as all Chautauqua activities in City Park are.